This is the ultimate combo tour for experiencing the cloud forest. 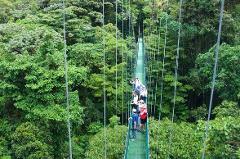 Walk along suspension bridges with an expert guide, ride a silent tram up through the canopy and finally fly across the canopy on zip lines. 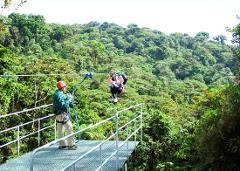 The Sky Trek Canopy Tour in Monteverde is located 6 km from the town of Santa Elena and about 3 km from the Santa Elena Cloud Forest Reserve. 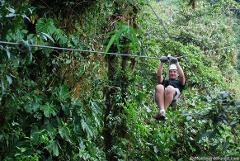 Flying across the misty cloud forest of Monteverde is one of Costa Rica's signature experiences. 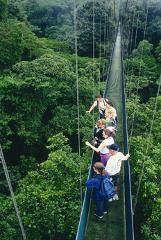 The Hanging Bridges are a more tranquil introduction to the ecology and natives of the forest canopy. 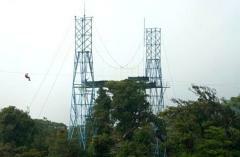 local expert guide will teach you about nature, during this moderate walk that combines trails and hanging bridges. The slow-paced Sky Tram gondolas soar smoothly through the cloud forest, offering up endless views during their mountainous ascent. Accompanied by a bilingual guide, tour takers will be able to stop the tram at any point, a feature that allows for magnificent, one-of-a-kind photographs to be captured and tropical birds to be spotted. Sky Trek fly from the top of the Mountain down to the base. 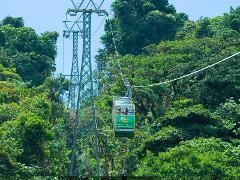 ride through the Cloud forest Canopy. Sky Trek is the top of the line of Canopy Tours, because it incorporates some significant differences, such as superior breaking systems, wider steel platforms, highly trained staff. Our major concern its safety, the prime objective of our staff is to provide a wonderful tour with a high standard of security, this is why the equipment is top quality like world class French made Petzl harnesses.